Leptospirosis is a bacterial infection that is contracted from the urine of wildlife. Cases are far less common in winter months due to the fact that the bacteria cannot survive freezing temperatures. Dry heat kills the bacteria, but it thrives in stagnant water, alkaline conditions, dampness, and mud. Most pets contract the disease when they come into contact with a body of water that is infected with the bacteria, such as a puddle, rainwater, or drain. The disease spreads via bodily fluids, through the bloodstream, and usually gets flushed into the kidneys where it often remains and reproduces, infecting the urine. Here it spreads to other animals that come into contact with the infected animal’s waste. The severity of the infection depends on the strength of an animal’s immune system. Younger animals with less developed immune systems are at a much higher risk of death when contracting leptospirosis. Pets that are the most at-risk for contracting the infection are hunting dogs, pets that live in wooded areas, pets that live on farms, or pets who live with other animals. 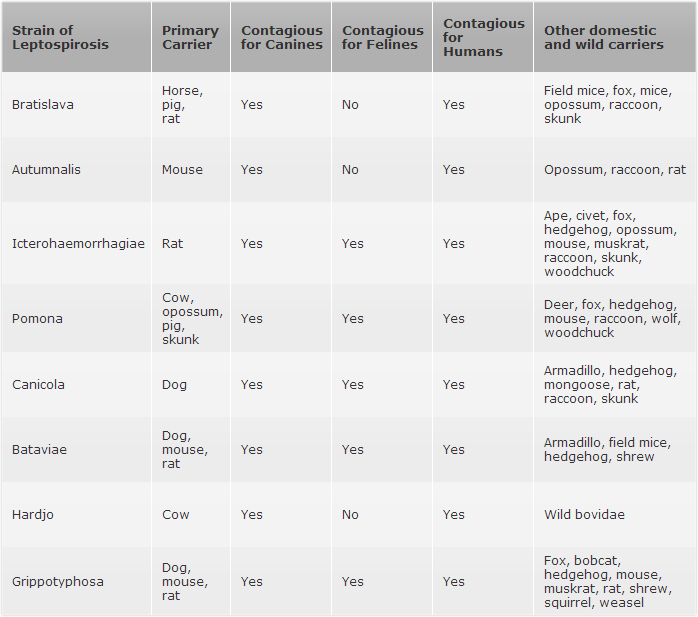 While there are over 213 strains of leptospirosis, only 8 can infect humans and dogs, and 5 can infect cats.